I hope you are all doing well and are having a wonderful Valentines weekend so far! I put together a last minute Valentines Day gift guide last year (post here) and I got such a great response from it that I thought I would put together a 2016 edition. Don't fear, there is still time to find that perfect Valentines Day treat and if you are still on the hunt for something then this is the post for you. I decided to opt for a mixture of items with different price ranges so there might be a last minute idea for everyone. Everything included could be gifted individually or even added to a little Valentine's goodie hamper - the decision is yours! 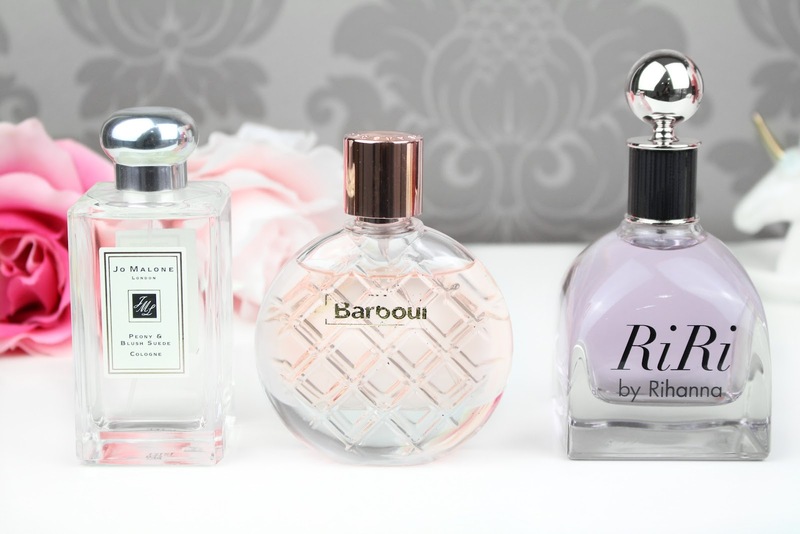 Firstly, we have some classic Valentines Day gift ideas; Lingerie and Perfume. Both are great options and you are never limited for choice. Last year I featured a gorgeous Victorias Secret Bombshell lingerie set, however, this year I wanted to go for an option that was easier to get hold of if you don't necessarily live near a Victorias Secret store and something with a more affordable price tag. New Look have some gorgeous Lingerie sets all ranging under £15 and they are always my high-street go to. This particular bra is one from last year, however, there are some stunning styles to choose from on the New Look website (and of course, in store). Moving on to the perfume, I always think this is a great gift option whatever the occasion and there are always so many to choose from...plus, let's be honest, a girl can never have too many! The first option I wanted to share with you was Jo Malone Peony & Blush Suede, one of my all time favourite fragrances. This fragrance is incredibly soft, seductive and charming! The formulation consists of blooming Peonies, jasmine, rose, gillyflower and juicy red apple, combined together with the soft blend of blush suede. The second fragrance is a brand new one to my collection and one that I will be reviewing in full really soon. Barbour recently launched their first ever fragrance line, including Barbour for her*. This fragrance has a gorgeous and elegant floral blend of rose, jasmine and blush peony to create this beautifully evocative eau de toilette. This is a rural-inspired scent that blends the soft notes of musk and sweet vanilla for a timeless sophisticated impression. This is very similar to Jo Malone Peony & Blush Suede, however, as an eau de toilette it provides a light scent. The final fragrance I have to share with you today is a celebrity released scent by Rihanna and I will be featuring a full review soon also. RiRi by Rihanna* is a flirty floral that is super feminine, mischievous and playful. The formulation consists of Passion Fruit extract, Rum Absolute, Sparkling Cassis, Italian Mandarin, Japanese Honeysuckle, Pink freesia, Madagascar Vanilla, Sandalwood and so much more to create an all round gorgeous fragrance. Yet again, Chocolate, Champagne and Roses are another wonderful option and I would love to receive any of these for Valentines Day. There are so many options to choose from on Valentines Day and throughout the year when it comes to Chocolate but I decided to feature the Book of Hearts, a Tesco Finest selection that consists of delicious dark, milk and white chocolate hearts with luxuriously indulgent fruit, nut and Marc de Champagne fillings. They are seriously amazing and I may or may not have sneaked a few whilst taking my photos haha (eating the props again haha). Now, being perfectly honest I am not a big drinker, however, when I do decided to have a few glasses it will always be a cocktail or some champagne. 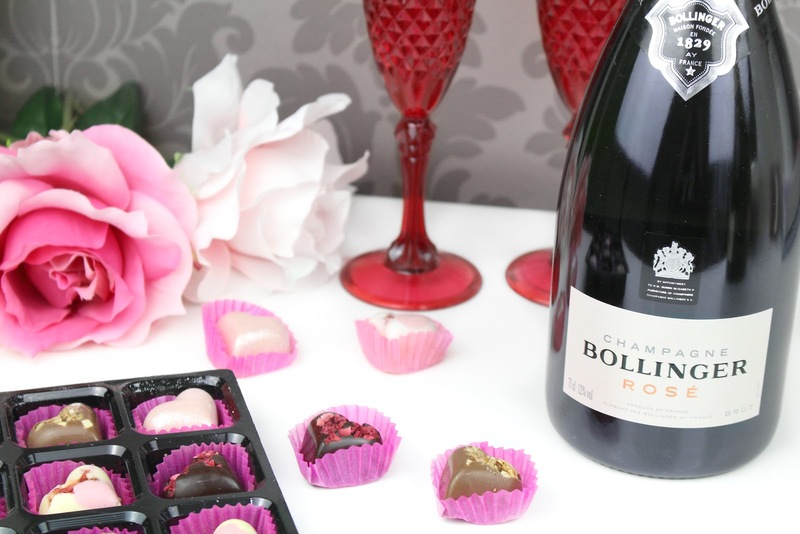 Champagne Bollinger Rose is a twist on classic champagne and will be sure to leave a lasting impression. Also, how gorgeous are the rose gold features on the bottle? You all know how much I adore rose gold haha. Finally, flowers are always a wonderful option no matter the occasion. Oh, "A rose by any other name would smell as sweet" (quoting Romeo & Juliet...swooning over Leonardo DiCaprio)...roses have been represented at showing affection for years and I absolutely love them. 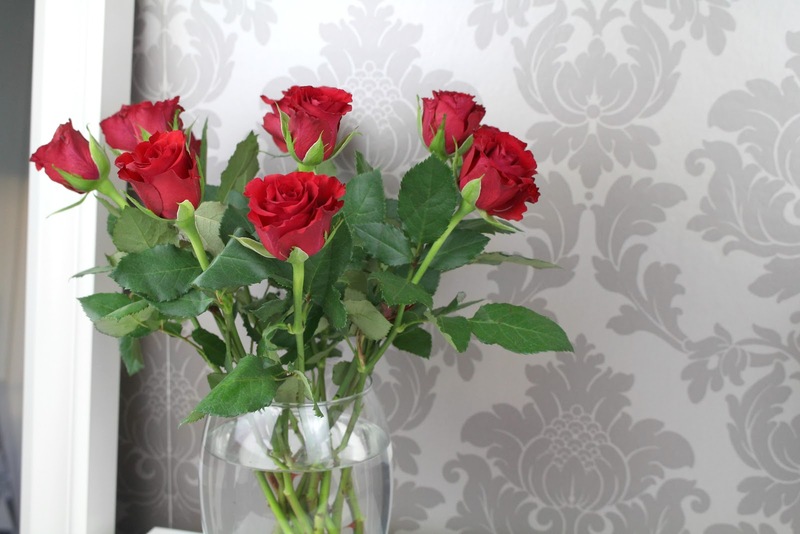 Whether you are thinking of treating your loved one to a single rose, a bouquet or 100 (oh, Instagram expectations) they will always go down a treat. Next I wanted to share with you some pampering options. Candles make a gorgeous gift alone or in a hamper and even help set the mood and add a touch of aesthetics. The first candle I wanted to share with you was by Yankee Candle and I honestly think it was made for me haha. This is a limited edition trio candle that featured Buttercream, Red Velvet and Chocolate layers...all of my favourites things! These are selling out like no tomorrow so even if you are a fan of sweet smelling scents I would definitely recommend you try and pick one up...I know I am going back to stock up for the year haha. The second candle I wanted to share with you was a new one to my collection by Spry in their Persian Rose* scent. Even when this candle is sitting in my room not burning it leaves such a gorgeous aroma that fills the air. The formulation consists of delicate musk, amber and violet leaf that just compliment each other so well. Such a mesmerising floral scent and an alternative to Jo Malone. Moving on, when I think of pampering products there is one brand in particular that I will always think of and that is LUSH. This super cute 'In your Dreams' set is proof that the best things come in small packages. 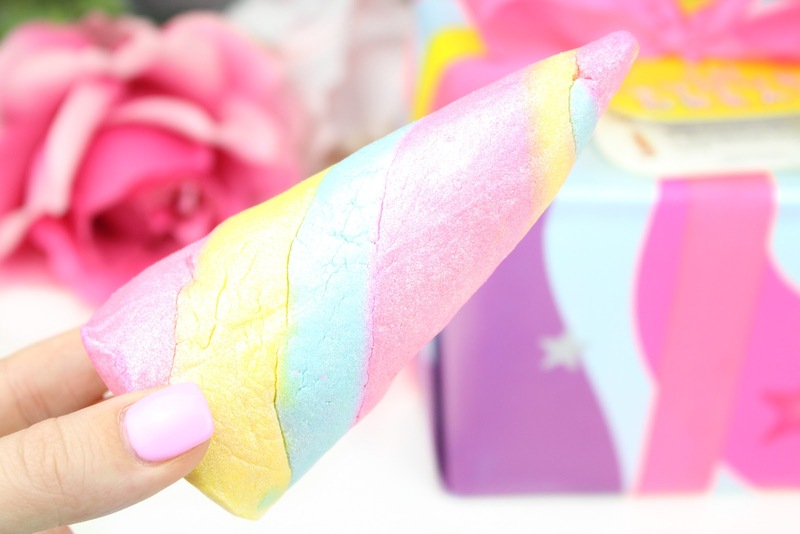 Swirled Unicorn Horns and magical Love Spells are no longer a fantasy with these specially selected bath bombs featuring neroli, lavender and rose. Finally, if you are looking for something that does all of the work for you then I would recommend checking out Glossybox*. 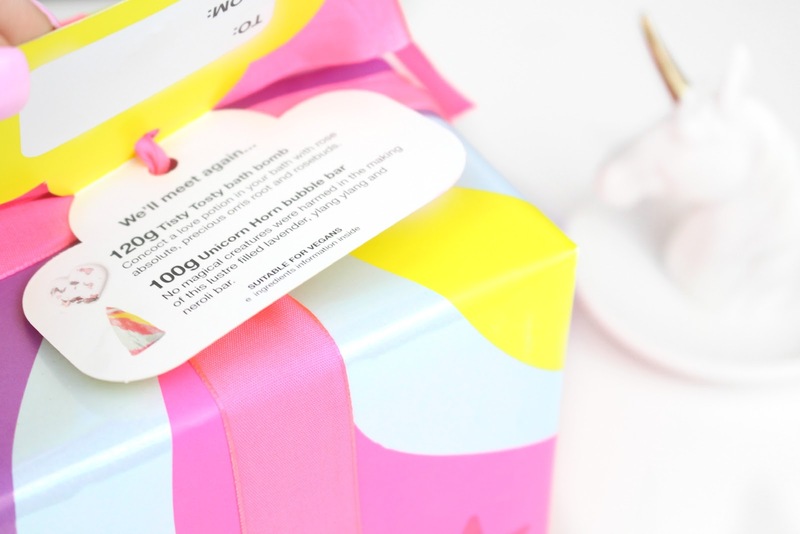 They offer a subscription service that would make the perfect treat this Valentines Day that would send a box to your loved ones door throughout the entire year! They create carefully selection beauty and lifestyle boxes with the added bonus of special limited edition releases perfect for anyone. You can see my Valentines Day* box review here. If you are looking for something more techy then I would definitely recommend a super chic phone case by Skinny Dip or some Solo2 Wireless Beats by Dr Dre (of course, all in rose gold). 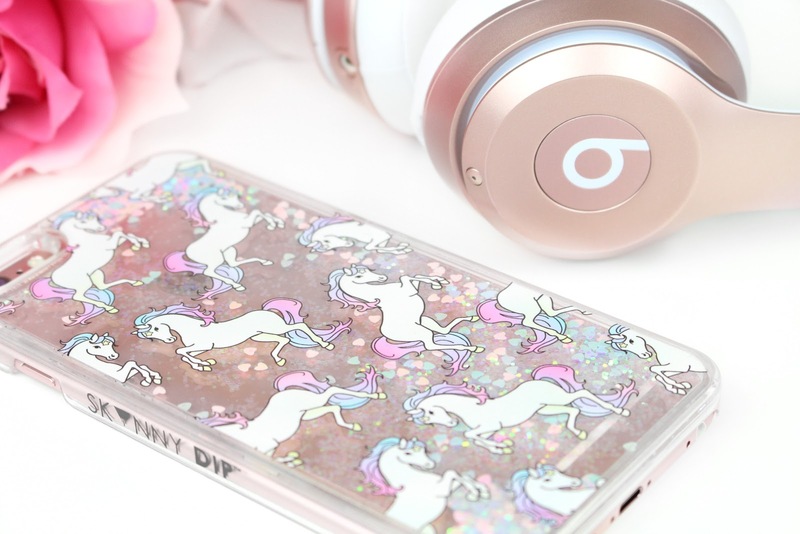 This Skinny Dip Glitter Unicorn case would make the perfect addition to anyone's phone. This perspex case doesn't only look fab but it also offers premium protection against bumps and drops. The unicorns and glitter give this case an added special touch and coming in at £18 would make such a thoughtful gift. There are so many different options on the Skinny Dip website there will sure be something perfect for that special someone in your life. I have always loved technology, I mean, I even work for the worlds leading technology distributor! So, when I saw that Dr Dre had released some Special Edition Solo2 Wireless Beats in rose gold I was instantly sold. Dr Dre Beats have been around for a good few years now but they always have such incredible reviews and honestly, since using them I have not gone back to using anything else. There are some great options online from different shades, styles and accessories...I have become completely obsessed with them. 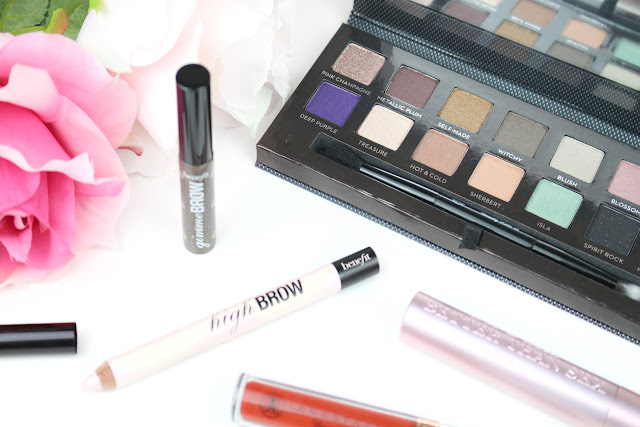 Undecided on what to get your makeup addict partner?! A selection of their favourite makeup loves would definitely go down a treat. Nothing says attention to detail that a partner knowing exactly what makeup you like and use - getting your foundation shade right definitely deserves a gold star and some brownie points! The great thing about makeup is that you have the biggest selection from drugstore to high end with a range of different prices available that are easily purchasable anywhere. 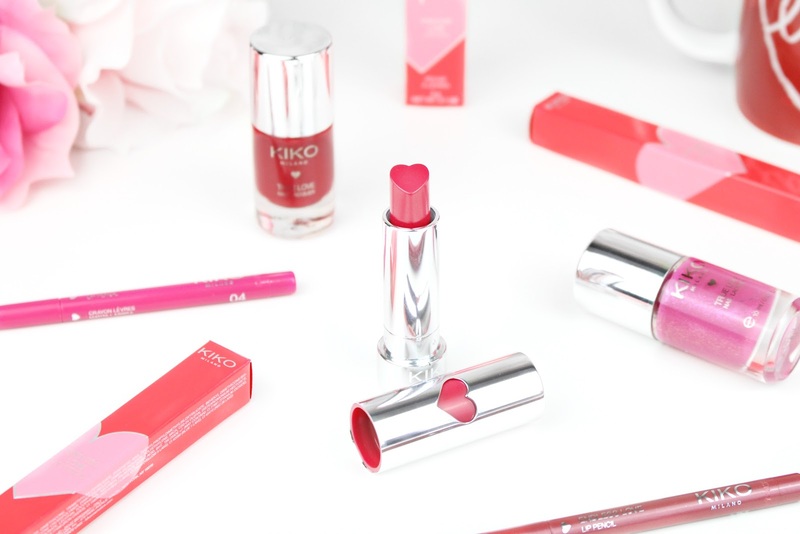 If you are looking for some options then KIKO Milano have recently launched their new Best Friends Forever* collection that features a selection of gorgeous lipsticks, lip liners, nail polish, palettes and more than just scream love and Valentines Day. KIKO is one of my favourite makeup brands and I am always impressed with their limited edition collections. Have you had a search through Instagram? Maybe something from Anastasia Beverly Hills, Benefit Cosmetics, Too Face Cosmetics (hint hint, they have just launched their new Chocolate Bon Bon palette) etc. would be another great option?! These are some of my all-time favourite makeup brands and they are constantly launching new products to their lines that are completely lust worthy. If I was to receive a selection like the above for Valentines Day I would be one happy girly! I hope you all enjoyed my last minute Valentines Day Gift Guide and if you are still thinking of a last minute gift it has really helped you out. Everything featured in this post is easily accessible in-store if you need to quickly pop out and purchase something or available with express next day delivery online (this will vary from store to store). I am not saying you need to buy each other gifts on Valentines Day as I know it is not a holiday for everyone but if you were in need of some ideas this post is here to help. Also, Valentines Day is NOT just for couples. My Best Friend Kirsty surprised me with a card and honestly it put the biggest smile on my face! (Thank you sooo much Kirsty!) I would absolutely love to receive any of these gifts for Valentines Day or pretty much any time of the year to be honest. If you have any other last minute gift ideas pretty please share them in the comments below as I would love to hear them! Like always lovelies, if you have any questions, requests or if you just want a chat you can contact me on my social media or leave me a comment below. I love hearing from you all and I make sure to read every single comment…they really make. I really like this post! (If only my boyfriend could see this!!) I would never think of getting a phone case for valentines, but it actually seems like a really nice gift! Hope you have nice Valentines Day! I would love getting some of these gifts, some really good choices! I absolutely love that bra, it's so gorgeous! I also like that lipstick, looks like a really good shade! Oh wow I love this. It's so pretty!